This blog articles about eBook,software,game and tutorials. It is note which is for only gate 2017 examination. 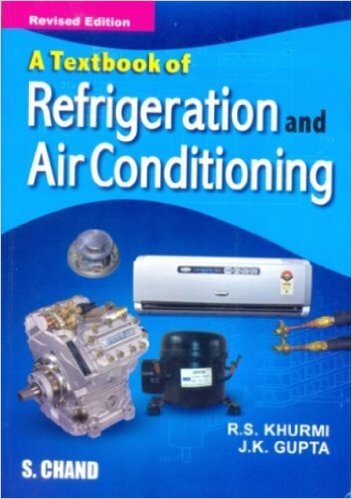 This is free ebook for mechanical engineering. 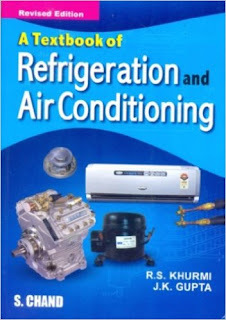 this book is witten by r.s khurmi also say that j. k publication. Engineering Materials and Their Properties. Manufacturing Considerations in Machine Design. 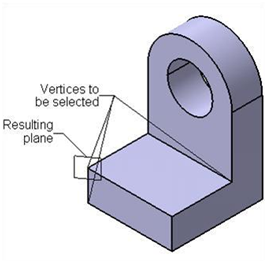 Simple Stresses in Machine Parts. 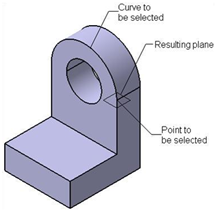 Torsional and Bending Stresses in Machine Parts. 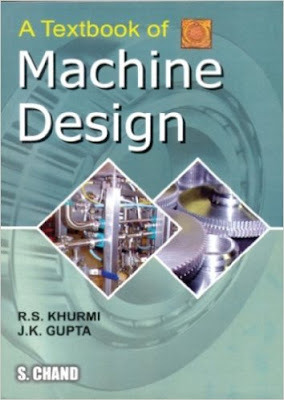 This is publication is best for engineering but most suitable of GATE is R.K rajput. for download click here . Reference element is the features that have no mass and volume are used only to assist we in the creation of the models. They acts as a reference for drawing a sketches for features, defining the sketch plane, placing placed features, assembling components, creating sketched based feature, and so on. The features are generally not created on a same plane; therefore we need to select the other defaults planes are creating new planes to be used as a sketching plane for other feature. Planes are used as the sketching plane for drawing sketches for the sketch-based features, Appling references to the placed features, and so on. The sketch of the based feature is generally drawn using one of the default planes as the sketching planes. After creating the based feature, we can select one of its paces as the sketching plane to draw the sketch for the other-based features. However sometimes we may need to draw a sketch on a plane, which is add one offset distance from the planner face of the base feature. To create a new plane chooses the plane tool from the reference element (extended) toolbar. When we invoke the plane definition dialog box and select plane to offset from plane type on dialog box. 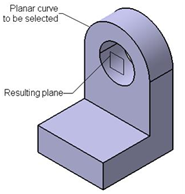 Select the plane or the planar face from which the offset plane need to create now we can set the value of offset distance from the offset spinner, we can also specify the number copies of the new plane in instance(s) spinner and then ok. 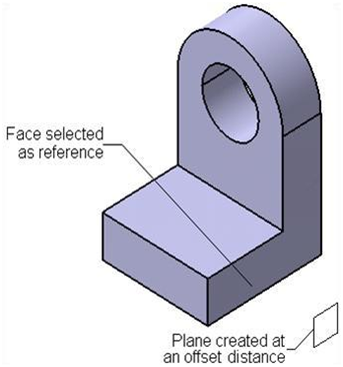 The parallel through point option in the plane type drop down list is used to create an offset plane that is parallel to reference plane or planar face and passes through specified point. To create a plane, select the parallel through point option from the plane type, select a plane or planar face from the geometry area and select a point. Select point or vertex from geometry area and then choose OK. 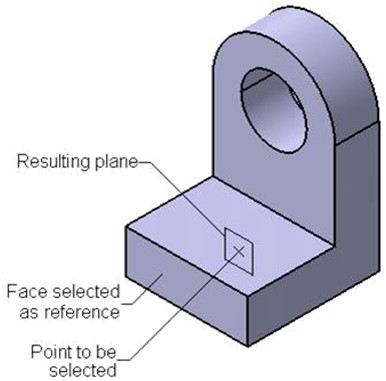 The angle/normal to plane option in the plane type drop–down list is used to create a plane at an angle to a reference plane or face. We can also create a plane normal to the selected plane or face. To create a plane using this option, select the angle/normal to plane option from the plane type drop-down list; we will be prompted to select the rotation axis. 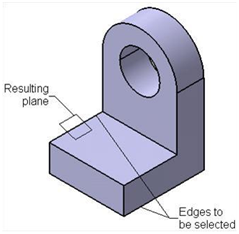 Select an edge of the model, sketched line, or axis from the geometry area that will be used as the axis of rotation; we will prompted to select the reference plane. Select the reference or plane or planar face from the geometry area such that the rotation axis and the selected reference plane are parallel to each other; the preview of the plane is displayed set the value of rotation angle in the angle spinner. To reverse the direction of the plane creation, specify a negative angular value. Next, choose the ok button from the plane definition dialog box. If we choose normal to the plane button from the plane definition dialog box, a plane will be created normal to the reference plane. We can also create multiple copies of the plane using the repeat object after ok check box. 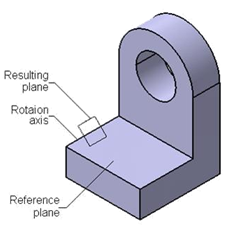 If we select the project axis on reference plane check box the resultant plane will be created in the reference plane by projecting the rotation axis over the reference plane. The through three points in a plane type drop down list is used to create the plane passes through selected points. On selecting this option, we will be prompted to select the first point Vertex, or an endpoint of a line from the geometry area. On doing so, we will be prompted to selected the second point. Select the second point from the geometry area. 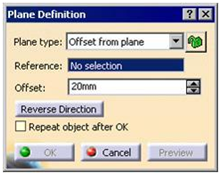 Similarly select the third point; choose ok button from the plane definition dialog box the resulting plane will be displayed. The Through Two Lines option in the plane type drop-down list is used to create a plane that will be passes through selected lines, edges, or an edge a line. When we select this option we are prompted to select the first line. Select an edge, sketch line, or an axis from the geometry area; we will be prompted to select the second line. After we select the second line the preview of the plane will be displayed choose the Ok button from the plane definition dialog box. The Through point and a line option in the plane type drop-down list is used to create a plane that passes through a point and a line. When we select this option, we will be prompted to select this point, we will be prompted to select a point. Select a point through which we want the plane to pass; we will be prompted to select a line. Select a line, axis, or edge from the geometry area through which the plane will pass; the preview of the plane will be displayed in the geometry area. Choose the Ok button from the plane definition dialog box. OK from the plane definition dialog box. The Normal to curve option is used create plane that is normal to a selected curve. On selecting this option, we will be prompted to select a reference curve. Select the curve from the geometry area; the preview of the normal plane, placed of the midpoint of selected curve, is displayed. Note that, by default the midpoint the selected curve is considered as a point to place the plane normal to curve. If we do not want create a plane in the middle of the selected curve, select appoint on a curve/vertex/edge where the plane will be placed. Next, choose the Ok button from the plane definition dialog box. The equation option is used to create using the equation Ax + By + Cz=D, where the values of A, B, C, and D are variable and can change to modify the orientation of the plane. When we select this option the plane definition dialog box will expand and the A, B, C, and D spinners will be displayed. We can set the values in these spinners to create a plane using the above mentioned equation. The normal to compass button in this dialog box is used to create a plane normal to the compass. The parallel to screen button is used to create a plane normal to the current view of the screen. After specifying the parameters, choose the ok button from the plane definition dialog box. 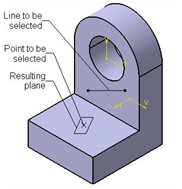 The mean through point option is used to create a plane at an orientation defined by the mean of the selected points. On selecting this option, we will be prompted to select points. Select the required points or vertices from the geometry area. The name of the selected points and vertices are displayed in the points display box in the plane definition dialog box. The preview of the plane created with its orientation depending on the mean of the selected point, is displayed in the geometry area. Choose the Ok button from the plane definition dialog box. 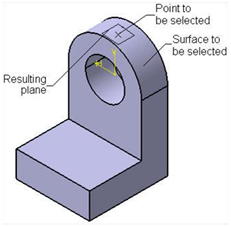 The tangent to surface option is used to option create a plane tangent to selected surface and passing through a selected point. On selecting this option, we will prompted to select the reference surface. Select a point, tangent to selected surface, is displayed. Choose ok button from the plane definition dialog box. The Pad tool is one of the most widely used tools top create the base features. To a base feature using this tool, draw the sketch and exit the Sketcher workbench. Then, choose the down arrow on the right of the Pad tool in the Sketch-Based Features toolbar; the Pads sub-toolbar will be displayed. Select the Sketch then choose the Pads sub-toolbar; the sub-toolbar; Pad Definition dialog box will be displayed, we will be enter promoted to enter the required data to modified the pad. Also the name of selected sketch will be displayed in the Selection display box and the preview of the pad feature will be display in the geometry area. Set the value of the depth in the length spinner. to create the revoled feature , draw the sketch that will be revolvsd aroun the centre line, also known as axis. Next, exist the sketcher workbench and choose the Shaft button from sketch based features toolbar; the Shaft Defination dialog box will be displayed, also the preview of the shaft feature using the default parameters will displayed in the geometry area. The name of the sketch will be displayed in the Selection display box of the profile/Surface area. By default, the first angle spinner will displays 360deg. Therefore, the sketch revole by 360deg. We can also set the angular values of the first angle and second angle spiner to define the angle in the first and second directions. Note that the sum of the angles must be equale to or less than 360deg angle.we can also Reverse direction button and thin shaft features from the shaft defination dalog box. Toolbar: Sketch-Based feature > Pad-sub toolbar > Drafted filleted pad. 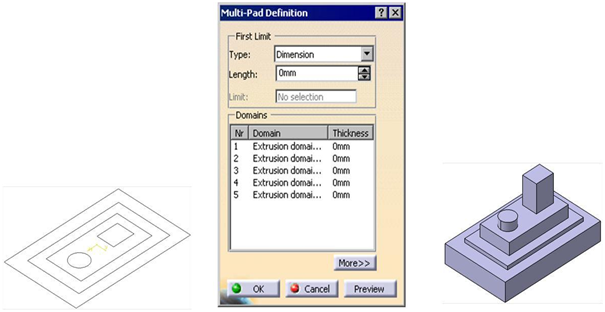 On doing so the Drafted filleted pad definition dialog box will be displayed, next we need to specify a reference for a second limit, now select the sketching plane on which the sketch is drawn as the second limit; and preview the extruded feature is displayed in geometry area. Set the value of depth of the extrusion in the length spinner. Specify the value of drafted angle in the angle spinner and then Ok.
Toolbar: Sketch Based feature > pads-sub toolbar > Multi-Pad. Note:- We can also create Pocket based feature as pad based features. Most components designed using CATIA V5-R19 are a combination of sketched features, placed features, and derived features. The placed feature is created without drawing a sketch whereas the sketched features require a sketch that defines its shape. The sketcher workbench provides the space and tools to draw sketches of the solid model. Generally, the first sketch drawn to start the decision is called the base sketch, which is then converted into a base feature. However, once we gate familiar with the advanced option of CATIA V5, we will also be able to use a drive feature or a derived part as the based feature. To draw a sketch, invoke the sketcher workbench in the part design workbench or the assembly design workbench by closing the sketch tool from the sketcher toolbar. Next select a plane to draw a sketch. Draw the sketch and proceed the part design or wireframe and surface design workbench to convert it into a solid model or surface model. Choose part design from Start > Mechanical design; we will enter into a part design workbench and new part dialog box will be displayed, enter the part name and select Enable hybrid design radio button and then ok to start new file workbench in part design workbench. Invoking the sketcher workbench using the sketch tool. To invoke the sketcher workbench using the method, choose the sketch tool from sketch. Select a plane from three default planes in the specification tree of from the geometry area the sketcher workbench will be invoked and the selected plane will be oriented parallel to the screen. We will be prompted to select an object or command. To modify units, invoke the Options General option to expand the tree. choose the units and then Ok. There are various standard toolbars and buttons that appear in the workbenches of CATIA V5. These toolbar are discussed next. 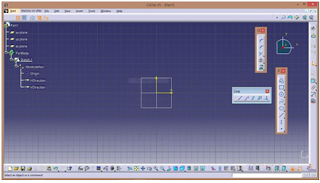 This toolbar is common in all workbench of CATIA V5. 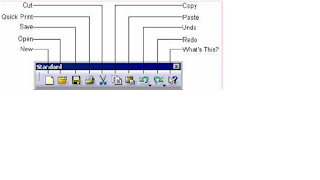 The tools in this toolbar are used to start anew file, open a existing file, save a file, and print the current documents. These buttons are also used to cut and place the selection and temporary clipboard, copy a selection, paste the content from the keyboard to the selected location, undo, redo, and invoke the help topics. What’s this? 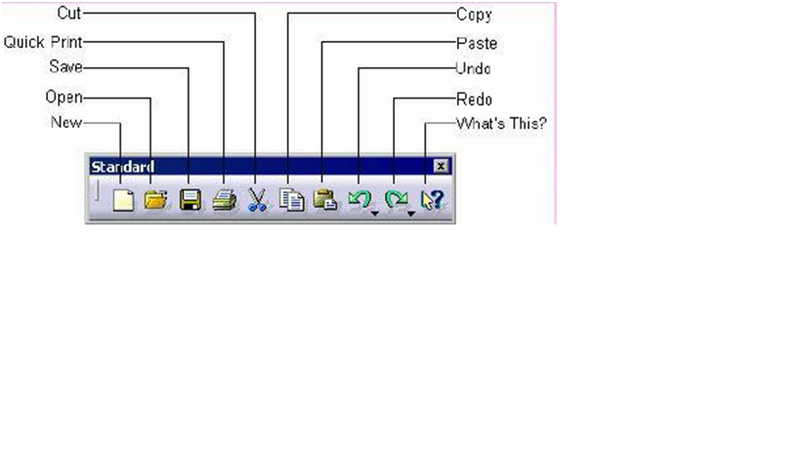 Provides help on the toolbar icons. Start>Mechanical Design>Part Design from the menubar. The toolbar in the Part design workbench are discussed next. The button in the view toolbar are used for manipulating the view of the model using the tool such as pan, zoom, normal viewing about a planar surface, face of plane, defining a render style and so on. It is available on the all workbenches.